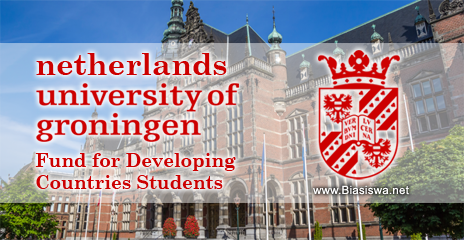 The University of Groningen is offering research grants to students from developing countries wishing to undertake their master's programme in Holland. The main objective of the Eric Bleumink Fund, established on 23 May 2000, is to provide financial support to Master's students from the poorest developing countries who wish to pursue a Master's degree (see Appendix 1 for the names of these countries). This initiative will not only improve the cooperation between the University of Groningen and universities in developing countries but will also raise the level of academic expertise in these countries. The University of Groningen (Rijksuniversiteit Groningen) was founded in 1614. Since then its growth and development have reflected changing views and social developments. The University's image has gradually changed: where once it was a fortress of stored knowledge, it is now an institution with its doors wide open to society. Course Level: Scholarships are open for Masters programme, Masters (MSc/MA/LL.M. ), Undergraduate Bachelors, Associate Degree and Other Degrees. Afghanistan, Algeria, Angola, Antigua and Barbuda, Argentina, Armenia, Azerbaijan, Bahamas, Bahrain Bangladesh, Barbados, Belarus, Belize, Benin, Bhutan, Bolivia, Bosnia and Herzegovina, Botswana, Brazil, Brunei, Bulgaria, Burkina Faso, Burma, Burundi, Cambodia, Cameroon, Cape Verde, Central African, Republic Chad, Chile, People's Republic of China, Colombia, Comoros, Democratic Republic of the Congo, Republic of the Congo, Costa Rica, Cote d'Ivoire, Croatia, Djibouti, Dominica, Dominican Republic, Ecuador, Egypt, El Salvador, Equatorial Guinea, Eritrea, Ethiopia, Fiji, Gabon, The Gambia, Georgia, Ghana, Grenada, Guatemala, Guinea, Guinea, Bissau, Guyana, Haiti, Honduras, Hungary, Indonesia, India, Iran, Iraq, Jamaica, Jordan, Kazakhstan, Kenya, Kiribati, Kuwait, Kyrgyzstan, Laos, Latvia, Lebanon, Lesotho, Liberia, Libya, Lithuania, Macedonia, Madagascar, Malawi, Malaysia, Maldives, Mali, Marshall Islands, Mauritania, Mauritius, Mexico, Federated States of Micronesia, Moldova, Mongolia, Montenegro, Morocco, Mozambique, Namibia, Nauru, Nepal, Nicaragua, Niger, Nigeria, Oman, Pakistan, Palau, Panama, Papua New Guinea, Paraguay, Peru, Philippines, Poland, Qatar, Romania, Russia, Rwanda, Saudi Arabia, Samoa, Sao Tome and Principe, Senegal, Serbia, Seychelles, Sierra Leone, Solomon Islands, South Africa, Somalia, Sri Lanka, Saint Kitts and Nevis, Saint Lucia, Saint- Vincent and the Grenadines, South Sudan, Sudan, Suriname, Swaziland, Syria, Tajikistan, Tanzania, Thailand, Timor Leste, Togo, Tonga, Trinidad and Tobago, Tunisia, Turkey, Turkmenistan, Tuvalu, Uganda, Ukraine, United Arab Emirates, Uruguay, Uzbekistan, Vanuatu, Venezuela, Vietnam, Yemen, Zambia and Zimbabwe. 7. Hold the nationality of a country appearing in Appendix 1.